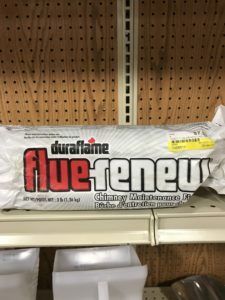 Duraflame Flue-Renew Firelogs are now in stock at Argyle Feed Store. This is a great time to pick up this chimney maintenance logs for the winter. About once a month after continued use, burn one of these logs once every 20 to 30 fires. By burning the flue-renew firelog, it will break down any pre-existing creosote build-up. The duraflame flue-renew logs were created for wood-burning stoves and wood-burning fireplaces. This includes wood stoves with catalytic converters which usually have high levels of creosote build-up. Use this to maintain open-hearth wood burning fireplaces that are between moderately used to heavily used. Please do not use the Duraflame Flue-Renew Firelogs with gas fireplaces, oil stoves, or pellet stoves. This entry was posted on Wednesday, December 20th, 2017 at 5:02 am	and is filed under News & Updates. You can follow any responses to this entry through the RSS 2.0 feed. Both comments and pings are currently closed.